An unidentified US Army soldier in Texas who was self-monitoring for Ebola was found dead on Tuesday. He had just returned from West Africa, and was found in Killeen near Fort Hood, where he was posted, base officials said. 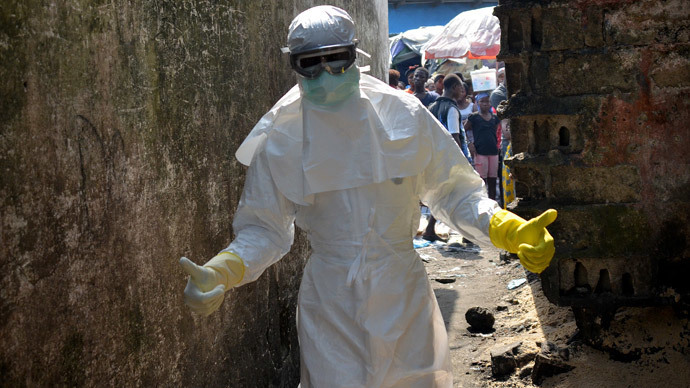 "At this point, there is no indication of the Ebola virus disease, but medical tests are under way to ensure there is no threat to the community," Army officials said in a statement. The soldier was found in the yard of an apartment complex. Killeen police, A HAZMAT team and several ambulances responded to the scene. They have sealed off the neighborhood and blocked the body from view, KWTX reported. Carrie Williams, director of media relations for the Texas Department of State Health Services, told CBS News that the soldier was in Liberia during deployment. "We are aware of the situation. Testing will occur. The risk is considered to be very low," Williams said. The soldier was one of 87 troops who had returned to central Texas’ Fort Hood on Wednesday after serving in Liberia since October. He was granted emergency leave from the 21-day Ebola quarantine for family reasons, the Army Times reported. The man was monitoring himself twice daily and reporting his status to medical officials, Army officials said, according to Reuters. The US Centers for Disease Control and Prevention notes that there have been four cases of Ebola diagnosed in the United States. The first was Liberian national Thomas Eric Duncan, who was treated at Texas Presbyterian Hospital in Dallas. He infected two nurses, Nina Pham and Amber Vinson. The fourth was Dr. Craig Spencer, who was diagnosed in New York City after returning from Guinea. Duncan is the only patient to have died from the virus.